Rosenthal Germany Porcelain Dish, Lotus Azure by Bjon Wiinblad. Serving Bowl. We will respond within 24 hours and will do everything we can to resolve the issue. Originating ZIP & Country: 80214 U.S.A.
Rosenthal Germany Porcelain Dish, Lotus Azure by Bjon Wiinblad. We will respond within 24 hours and will do everything we can to resolve the issue. Originating ZIP & Country: 80214 U.S.A. Weight: 1 1/2 Lbs. Rosenthal Germany Porcelain Dish, Lotus Azure by Bjon Wiinblad. 2pc Oblong Serving Trays. We will respond within 24 hours and will do everything we can to resolve the issue. Local Pick-up is free. 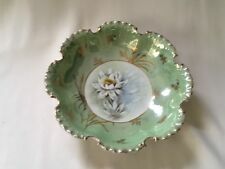 Originating ZIP & Country: 80214 U.S.A.
BEAUTIFUL ANTIQUE ROSENTHAL R&C MONBIJOU BAVARIA BOWL. PALE GREEN WITH WATER LILY/LOTUS PATTERN. GOLD ACCENTS AND TRIM. Rosenthal Germany Porcelain Dish, Lotus Azure by Bjon Wiinblad. We will respond within 24 hours and will do everything we can to resolve the issue. We are more then happy to assure you of the quality of the product. 5 3/8" high x 3 1/2" across top, 4 1/2" overall. Rosenthal China LOTUS WHITE Platinum Trim Bread and + Butter Plate 6"
This is for a Rosenthal China LOTUS WHITE Platinum Trim Bread Butter Plate. Great condition. The sale of this item will be considered final. We usually take multiple photographs of an item. The plate is in overall excellent condition. Rosenthal LOTUS WHITE 2 Salad Plates GREAT CONDITION from Dishfunctional. Two (2) Salad Plates by Rosenthal in the Lotus White pattern. It features an all-white design with an embossed rim. These salad plates are previously owned and in great condition with little or no signs of use or wear. Round bisque vase in the Open Lotus pattern from the Studio Line by Rosenthal. Artist is Rosamunde Nairac. 4 1/2" tall x 4 3/4" wide. Rosenthal Germany Porcelain Dish, Lotus Azure by Bjon Wiinblad. Local Pick-up is free. Originating ZIP & Country: 80214 U.S.A. Weight: 2 Lbs. Rosenthal Germany Porcelain Dish, Lotus Azure by Bjon Wiinblad. Lidded Jam Jar. We are more then happy to assure you of the quality of the product. We will respond within 24 hours and will do everything we can to resolve the issue. Rosenthal Studio Line “Lotus White” 5 cup platinum rim coffee pot designed byBjorn Winblad with a signed lid. 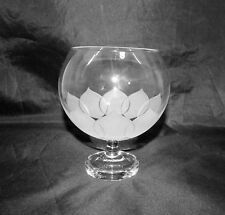 ROSENTHAL crystal LOTUS BLOSSOMS pattern Wine Glass or Goblet. • Frosted Petals. • Production date: 1969 - 2004. Image is illustrative of item being sold; image may not be of exact item. This vintage pattern was produced by Rosenthal from 1969 through 2004 and is now discontinued. It features a clear pattern with frosted petals at the base. This cordial is previously owned and in great condition with little or no signs of use or wear. This is in the Pattern 9006. Lotus, light blue petals on a white background. Dinner Plate(s). In very good condition.